What always strikes me at Dar Ben-Gacem is the sense of familiarity. From being welcomed in at the front door by a friendly face, to enjoying breakfast in the courtyard as if one was in their own home. One soon feels as if they were in the house of a dear friend or relative. When word of Interference first surfaced, the first international light art project in Africa, Dar Ben-Gacem was bound to take part in the project. How? By providing a home to a family. The big family of Interference is not only made up of the 100+ passionate and engaged volunteers that helped bring the festival to life, coordinated by the two project founders Aymen Gharbi and Bettina Pelz, but also by the civil society of the Medina. The idea of an international light art festival attracted and brought together people and artists from different backgrounds and environments, some of them having never heard about Tunisia before, except for perhaps the negative reports they might have heard in the news. Nevertheless, they were convinced by the project and prepared to, at their own cost, join the adventure. The idea was so new and intriguing, that the community was soon up on their toes helping in any way possible, by offering their beds to artists and volunteers, electricity for late night testings and to help carry around equipment. Pretty soon, the whole town was buzzing with energy and light and everyone was determined to ensure this vision would become reality! This non-budget festival allowed no obstacles to get in its way, proving that a powerful vision was stronger than anything money could buy! However, critique and gossip is never to be avoided and some people’s first reaction to the concept was surprised and sceptical, “why not look at the ground and illuminate the garbage polluting our alleys instead of projecting abstract shapes on to our walls?”, was a comment I overheard from passers-by in the Medina. Fair enough, the idea is far-fetched. However in retrospect, no one would argue about the festival’s relevance as a tool to promote heritage, intercultural dialogue and the importance of bringing art to the public space for the entire community to enjoy! Where there are movements to encourage culture, heritage and youth empowerment, there is Dar Ben-Gacem! The house became a home base for the team of the festival, offering rooms to its artists and space for its gatherings and meetings. It was a true delight to enter the house and see that all of the artists felt so comfortable and at home, wearing their slippers inside or even walking barefoot, cooking themselves in the kitchen and keeping their own food in the fridge. People from near and afar came together and found themselves living as a big family. Next to the remarkable help of the community and volunteers, was the willingness of competing businesses and hotels to lend a helping hand. Guest houses such as Dar Ya, La Maison Bleue and Dar el Medina generously offered their facilities, driven by the conviction that the festival is truly FOR the Medina. The idea behind the project was not for individuals to make lucrative profit but to offer an enriching experience to the entire community of the Medina. It was incredible to see so many businesses work together out of genuine love and passion for the Medina. Interference offered a valuable learning experience, especially to youth interested in the cultural sector, giving them the chance not only to participate in the organisation of an art festival, but to take place in workshops and trainings on various subjects such as curatorship, the physics of light, art, heritage and how to build up a light art festival from scratch! It was just as much an educative as it was an art project, proving that art must be shared and that every member of the community not only has the right to enjoy it, but also to be part of it. 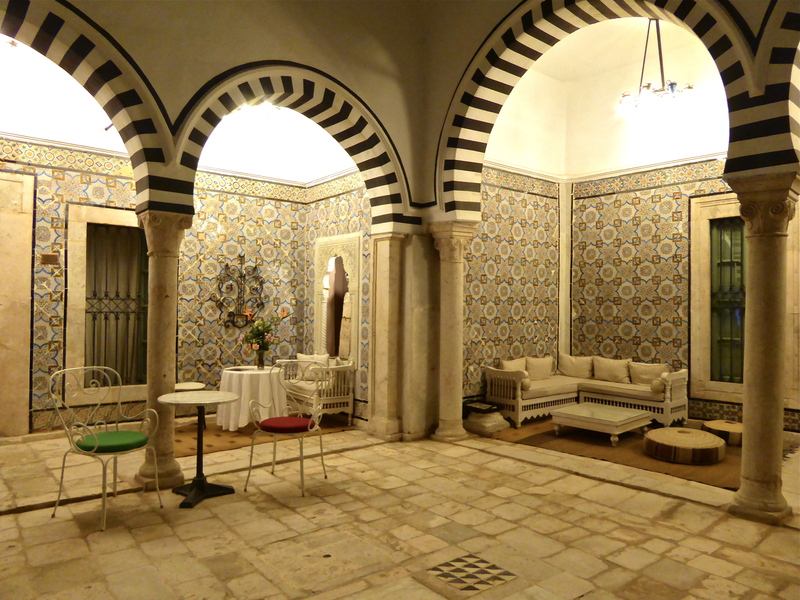 The Culture Trip, just published it’s list of top 10 hotels in Tunis, and the Dar Ben Gacem team is exited to be on the list! When I arrived in Tunis two months ago, Dar Ben Gacem was my home for the first week. 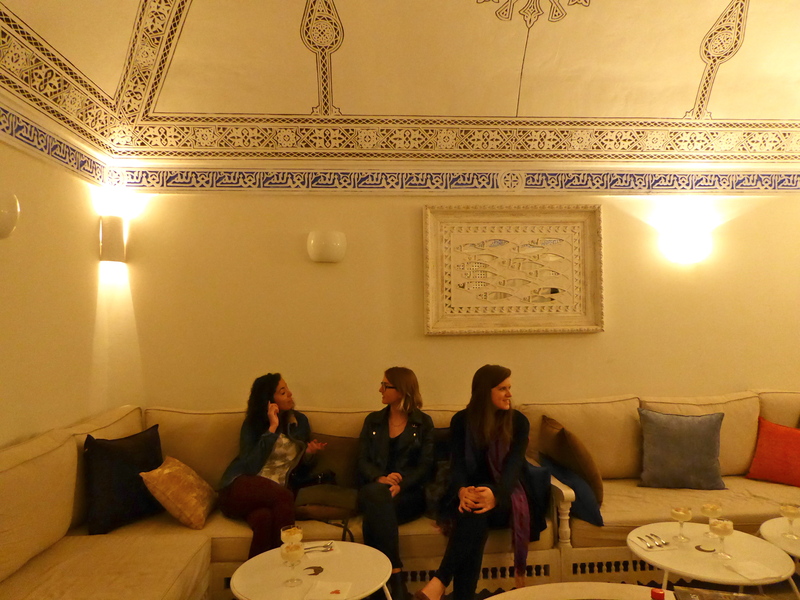 My family and I stayed there whilst we were flat hunting for me, and after long days pounding the streets of Tunis, returning to Dar Ben Gacem was always like stepping back into a world of calm. Once the heavy wooden door closes behind you, you’re free to make yourself at home around the Dar. We spent mornings having leisurely breakfasts in the courtyard, and evenings playing chess in the pavilion on the roof terrace. Eight weeks of Arabic lessons later, a friend in my class’s family came to visit her for her birthday weekend. 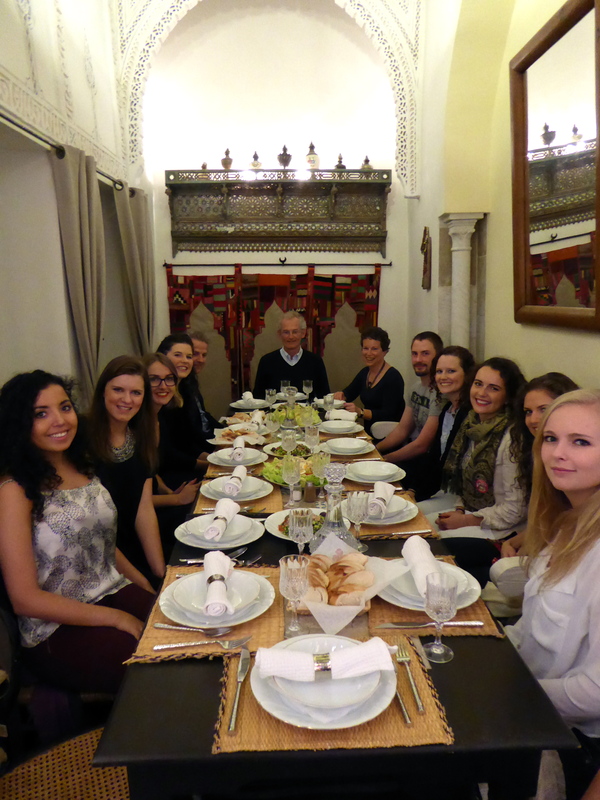 They too were staying at Dar Ben Gacem, so they invited ten of us to have dinner and spend the evening there. It was lovely to go back, and this time, as I lead the group through the cobbled streets of the medina, it really did feel like I was – to excuse the cliché – returning home. Everybody agreed the dinner was excellent. We ate in the dining room, which opens out onto the tiled courtyard. The food was served family style in big dishes in the middle of the table, so we all helped each other to piles of fish couscous, beautifully fresh salads, and a selection of other traditional Tunisian dishes. Everything was made by local ladies in the medina, so it really did feel as if we were sitting down to a meal like a traditional family. It was the perfect way for everybody to come together and get a taste of what life could have been like in the original Dar. For dessert we ventured upstairs to the seating area on the roof. We spent the rest of the evening there chatting away, drinking mint tea. The best thing about having dinner at Dar Ben Gacem was the freedom we had. We could nose around all of the treasures the hotel has to offer, and you really have the pick of the bunch when it comes to choosing where to spend your time. 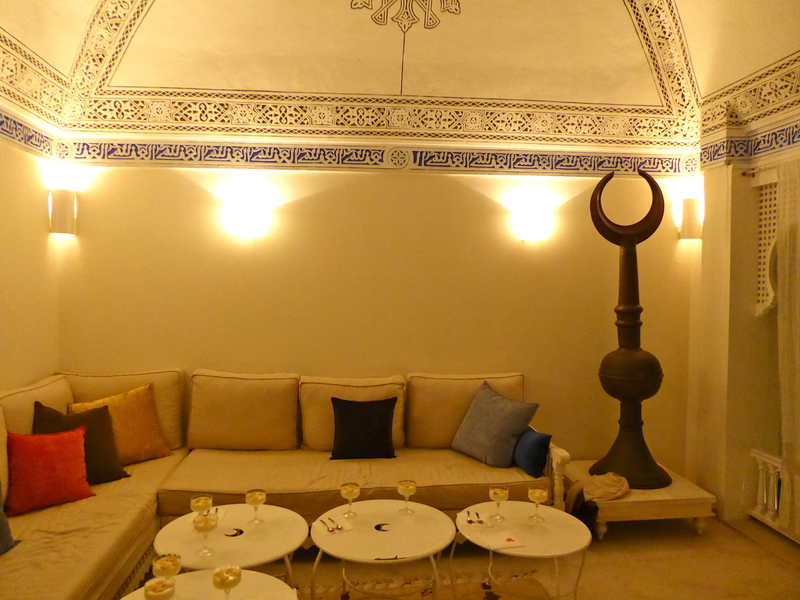 Being at Dar Ben Gacem meant it was a far more intimate and relaxed evening than it would have been at any restaurant.